Although every new genre of painting is accompanied by its share of resistance and criticism, abstract expressionism has arguably been the most controversial. The reasons for this are obvious: the images and colors are purely symbolic. 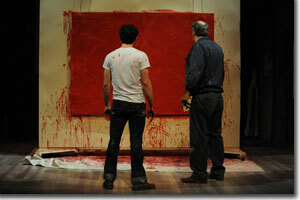 What they convey is entirely in the eyes, mind, and heart of the beholder—in this case, the artist, Mark Rothko—in the regional premiere of John Logan's Tony Award-winning Red, now running at Curious Theatre Company. Rothko, along with Jackson Pollack, Willem deKooning, Franz Kline, Clyfford Still, and others, is considered a key figure in abstract expressionism and its derivatives.1 As the audience enters the theatre, Rothko (Lawrence Hecht) sits in front of a blank canvas. 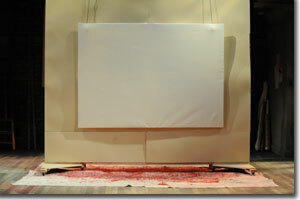 Unlike Art, a previous Tony winner, which focused on the value and meaning of a white-on-white painting (and the inter-relationships between those involved in the discussion), Red explores the artistic process and underlying experience and philosophy of the artist. Logan's script is brilliant, creating a compelling "theatre of ideas" in the true Shavian sense. Hecht's multi-layered performance is centered around the passion Rothko has for the artists and writers who have most influenced him, and the responsibilities that these creations place upon us: to push the boundaries of perception, consciousness, and human evolution. 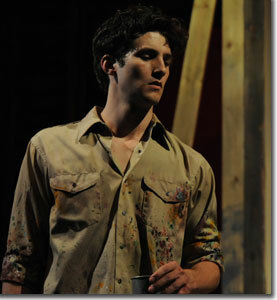 The playwright's chief conceit is to create an apprentice, Ken (Benjamin Bonenfant) to act as a counterpoint to Rothko's ideas and behavior. Bonenfant builds a marvelous character in subtle, detailed shifts of emotional and physical expression. 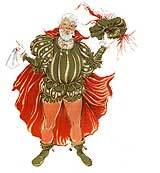 His Ken grows from an inexperienced and unformed neophyte, fresh from school, to an engaged and passionate artist. The climactic decision by Rothko, regarding a series of paintings for an exclusive client, results in a catharsis for both Rothko and Ken, as well as the audience. It is a remarkable moment representing the culmination of the artist and apprentice process. This dynamic interplay between Rothko and Ken reverberates in Susan Crabtree's finely detailed Bowery artist's studio. Like Rothko's initial meditation, the studio is largely about preparation: building frames for the canvases, mixing paints, hanging and moving the canvases, and drinking and debating. Yet, it works equally well when Rothko and Ken team up to apply the underpainting, choreographed to a classical LP that Rothko cues up on his basic, wooden box, portable record player. Director Christy Montour-Larson outdoes herself, showing us at every turn what a truly great play this is! 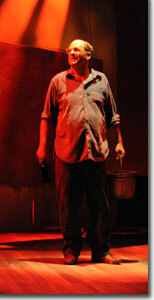 Curious Theatre Company's Red runs through June 16th. 303-623-0524, curioustheatre.org, or at the Curious Theatre Company box office at 1080 Acoma in Denver. Footnote: 1 "Orange, Red, Yellow," a 1961 canvas by Rothko, sold for nearly $87 million—a world auction record for a work of contemporary art—at Christie's this week (on Tuesday, May 8th, 2012). See the New York Times article.